But for those of you who are not the Queen of Hearts, and those finished making tarts, consider some terrific resources for making strawberry preserves. Strawberries, of all the berries, do well as freezer jam. Freezer jam tends to use less sugar and less cooking than the other versions (the pectin-free/sugar-heavy method, the pectin/sugar-heavy method,and the low-sugar/low-methoxyl-pectin (Pomona) preparations). Less cooking means a brighter color and more fruit flavor. If you’re making a regular batch of jam, you’ll need a half-flat for the standard recipe, which usually requires four cups of crushed berries. Consider how you’ll be using jam before you decide which method you’d like to use — low sugar or regular. I’m not hung up on eschewing pectin like others seem to be lately, especially since I use the low-methoxyl stuff which doesn’t have dextrose in it. But I do keep in mind that if you don’t use pectin, your jam will need more sugar to set. And that can be a good idea. When you have both to compare, you’ll find that the fruit flavor is actually lost in the low-sugar preparation, where in the sugary jam, it can hold its own against other ingredients. Plus, the color fades rather dramatically and relatively quickly with low-sugar strawberry jam. To make a small batch of pectin-free/full-sugar strawberry jam, watch this excellent new video from the folks at Cooking Up a Story, a video blog that features great interviews with local food movers and shakers. And to doctor up your strawberries with surprising nuances, check out Punk Domestics’ punkberry roundup for strawberry preservation. On this aggregate blog, preservationists (including me, from time to time) post unusual recipes. For strawberries this year, I see he’s got everything from strawberry-campari to smokin’ hot chipotle-strawberry to strawberry-orange. For the record, my own strawberry jam usually fits a floral profile (elderflower, rose geranium, mint, lavender) or a spicy profile (black pepper, allspice, balsamic, Sichuan peppercorn). I often use flavored syrups or bitters. My favorite was Sweet Cheeks pinot gris simple syrup, made by boiling down a bottle of wine with sugar until syrupy. This year? I made Retrogrouch, he of the low-sugar diet, some low-sugar Strawberry Fleur, which had elderflowers and various scented geraniums, from the Hoods I bought in PDX a couple of weeks ago. 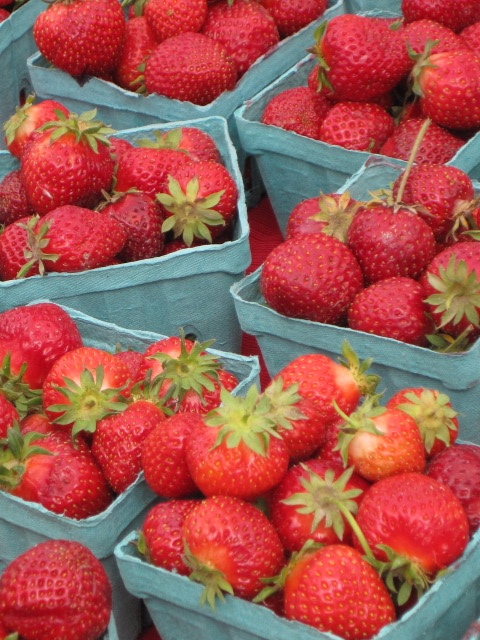 Which varieties of strawberries are best for jam? Check out my post here. You can mitigate the dark color issue if you choose a light berry like Bentons. But that’s not what I’m most excited about this year. It’s green strawberries! 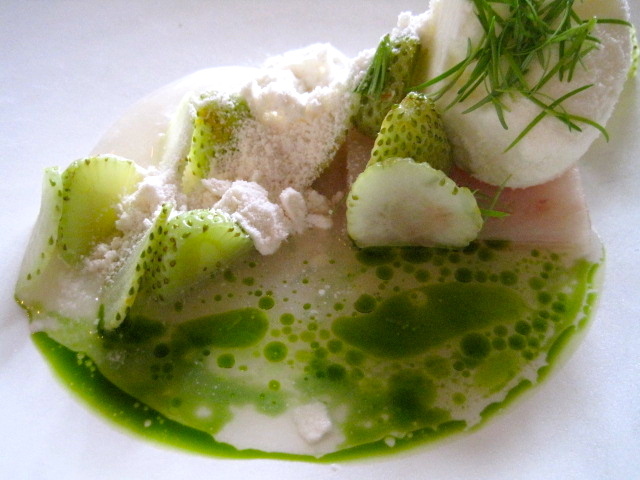 Green strawberries have become the darling of the chic restaurant this long, long spring in Oregon. Who knew they’d be so good with seafood? Above, you can see two lovely savory salads with greenies. The first photo is one of the dishes at the “Hunt, Gather, Feast with Hank Shaw” dinner at Castagna I attended this weekend. (Post about the meal here!) We ate cod three ways: smoked and cured as a base, and frozen and powdered in savory creams above. Above the scoop of frozen cod cream is locally foraged pine tips. The green strawberries were just slightly sweet, so it was perfect. 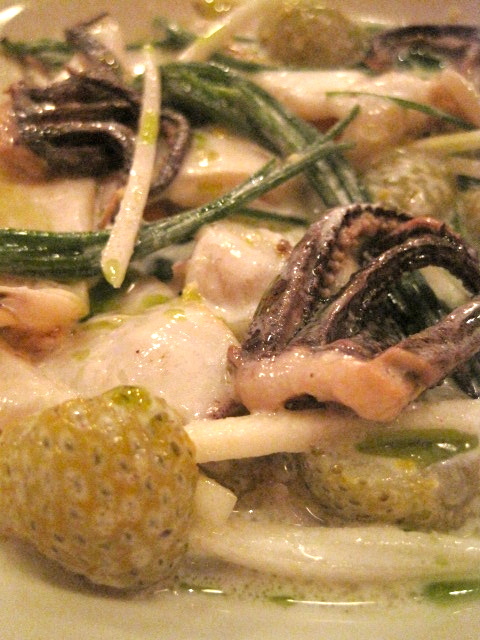 But even better, I’d argue, are the pickled green strawberry – squid – turnip batons – “an obscure Italian herb” salad from Park Kitchen. Picture isn’t great because of the lighting, but you get the picture. The strawberries are slightly pickled, and the salad is dressed with a lemony buttermilk. Delicious. 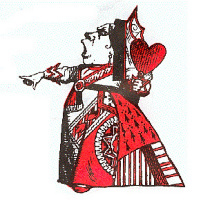 I may reprise my role as the Queen of Hearts next year, too. Forget this jam stuff. Off with their immature fruits! Slightly undercooking is better than overcooking. Oops. Absolutely essential to pick them young for hearts. The centers are tight and fuzzy choke-free. I found the ‘Green Globes’ were much nicer than the ‘Imperial Star’ for tight interiors. Do not attempt to cut a larger one in half, scoop out the choke, and think, oh, no one will notice! Ended up eating that one for lunch, since it wouldn’t freeze worth a cent. The flavor differences of the various artichokes seem to be minimal. Where they differ is in the shape of the bud, quickness to brown when cut, and meatiness, so variety does matter. My informal survey isn’t very reliable, admittedly, since I was working from plants in different areas with different fertilization, sun, etc. Trimming back the leaves is much easier to do when the thing is raw, believe it or not. The buds fall apart easily after being cooked (see #1). Although ferociously attractive to me, stuffed artichokes (I kept one of my mom’s 1970s vintage recipe cards with a photo for years) are just a distraction. Same with a mayonnaise dip. I’m straight-edge or butter. Either lemon or tarragon butter. If you poach the artichoke with tarragon and lemon, that’s good too. Just use twigs of tarragon instead of chopped herb. Nothing more unpleasant than thinking it’s just a piece of cooked tarragon, and it’s really an earwig nestled in its leafy grave. 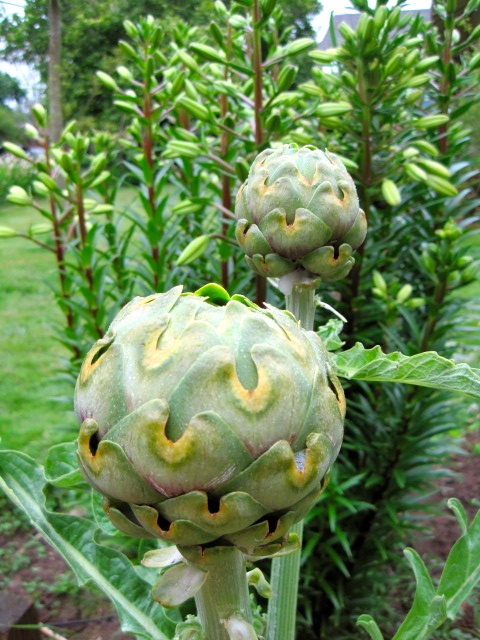 And along those lines, keep in mind beasties can and do burrow deep within an artichoke. Check all leaves before eating. This is easy to disregard when you’re in artichoke paradise, munching leaf after leaf. But you’ll thank me one day. 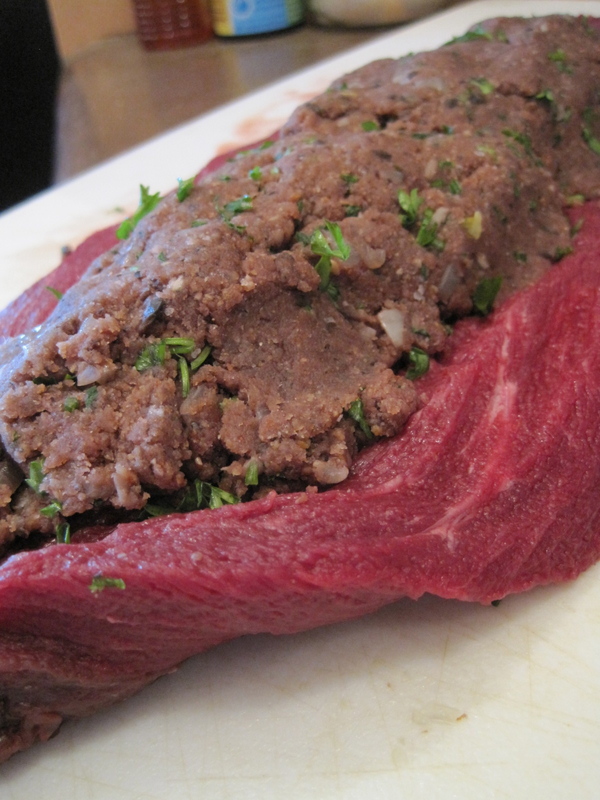 We were treated to stuffed elk tenderloin by my brother-in-law when we were in Montana. This method is courtesy of BIL’s mother, trying to keep up with a family of hunters. Elk is a rich-textured, bright red, mild-flavored game. Procuring your meat from hunters with good kill skills is crucial. We talked about how the meat was skinned and hung to age it. I realized that I shouldn’t complain about my husband’s bike paraphenalia ever again when I heard that carcasses are a frequent occupant in Montana garages in the fall and winter. You probably won’t be able to buy wild elk at your local restaurant, even in Montana, because laws prohibit, or at leas inhibit, its use in culinary settings. So when you see elk on the menu of your favorite restaurant, know it’s usually from somewhere like Canada or…egads…New Zealand. Wild elk, meanwhile, proliferate in the Western ranges. They can be quite canny, we learned from the ranchers at my recent conference. They herd up with cattle against predators, and seeking out pastures carefully prepared for cowfood instead of the rougher, less-maintained mountain grasses. But even with their mad skillz, elk are very lean, and you have to be careful not to overcook the meat, especially a tender cut like a tenderloin. The tenderloin is smaller than a beef tenderloin, so butterflying it is difficult. We tried to slice it open as evenly as possible. Once butterflied, we marinated the meat in a mix of soy, worcestershire sauce, beer, pepper, salt, and spices. As it marinated, I minced a couple of cups of little shiitakes, onions, and garlic. These were sauteed in butter and a bit of truffle oil, then mixed with breadcrumbs and parsley. We stuffed the tenderloin (I’d use fewer breadcrumbs and less stuffing altogether next time) and secured it en triage: kitchen twine and toothpicks. The rolled tenderloin was quickly seared on a hot cast iron pan, then popped in a 350 degree oven for just a few minutes to medium rare. We used the drippings from the searing, extending them a little with some wine, as an “au jus” just before serving. Speaking of Hank, I am so privileged and excited to be attending his wild foods dinner at Castagna on Sunday. It will feature foods foraged on a hike on Saturday. The hike/dinner celebrates his excellent new cookbook, Hunt Gather Cook. Can’t wait! Making strawberry jam? Choose wisely, intrepid voyager. Variety really does matter, and I find that the distinctions in color and flavor among our glorious Oregon strawberries are important — more important, perhaps, than in our other berry crops. Avoid anything grown in California. Don’t buy strawberries from the grocery store, since most of those berries are cardboard Californians, day-neutral cultivars bred for continual production, large size, color, and portability. They are dripping with very toxic pesticides and bloody with reprehensible labor practices. Sure, if you live in the Bay Area and can get strawberries grown at a smaller farm, I suppose you could buy California strawberries, since you don’t have much of a choice, but if you’re in Oregon, thank your lucky stars and read on! Because we live in strawberry heaven, and we don’t have to deal with that nonsense. Oregon, where it’s worth the wait. This year, I thought I’d shake it up. I bought a half-flat of the legendary Hoods while in Portland last weekend. These are berries that have their own Facebook page. Developed in 1965 by OSU breeders, this variety is known for its tastiness, early showing, and, unfortunately, the susceptibility of the plant to various diseases. Hence, cult status. Live fast, die young. Apparently, there are fewer and fewer growers willing to put up with this diva, so get ’em while you can. 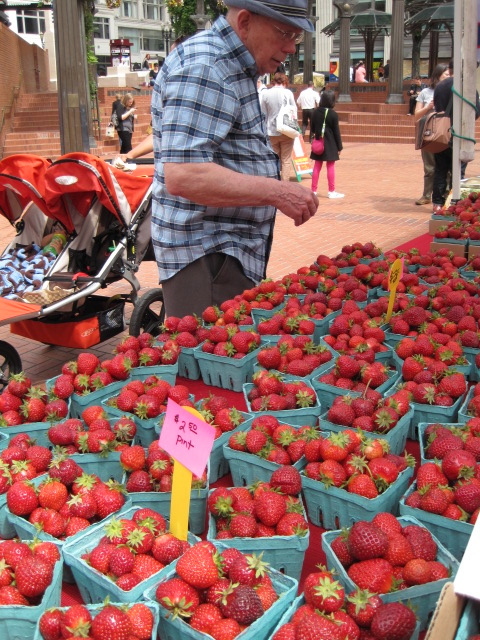 I bought mine from two very pleasant ladies at the Valley Berry Farm stand at the little farmers market in Pioneer Courthouse Square. 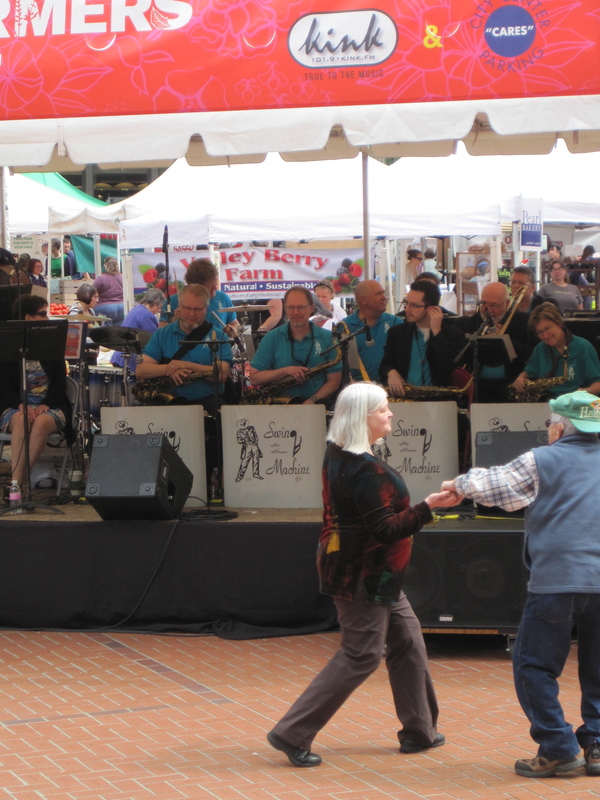 That’s the stand, behind the dancing couple and the big band. Yes, a big band. Awesome. Sorry, Eugene, PDX wins that round. The Hoods are slightly darker than Bentons, and they held up perfectly in the car for the entire day, not something that Bentons could do so well. The flavor is complex and not as sweet as other eating berries, but they managed to hold their shape well in my jam and in the fresh strawberry tart I made for dinner last night. I’m not sure I like the flavor as much as the Bentons, but they are a formidable rival. Both jam and tart were infused with flowers. 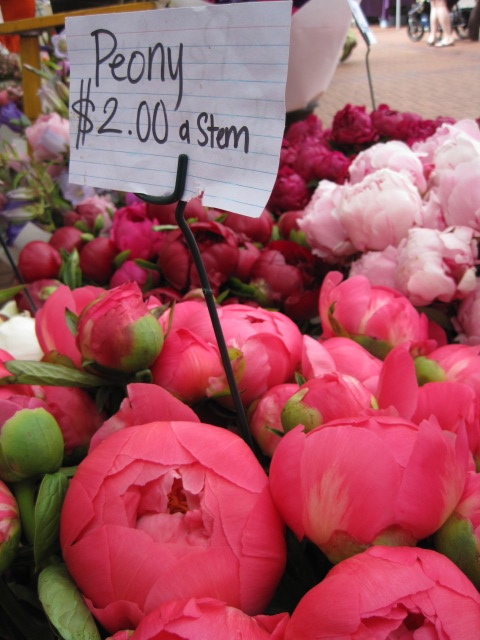 No peonies, but aren’t these beautiful? I added creme de violette and a touch of Hungarian barack apricot liqueur to the tart berries, and macerated the jam berries with elderflowers and rose geranium leaves. Always know sometimes think it’s me, but you know I know and it’s a dream. Next up, Bentons! 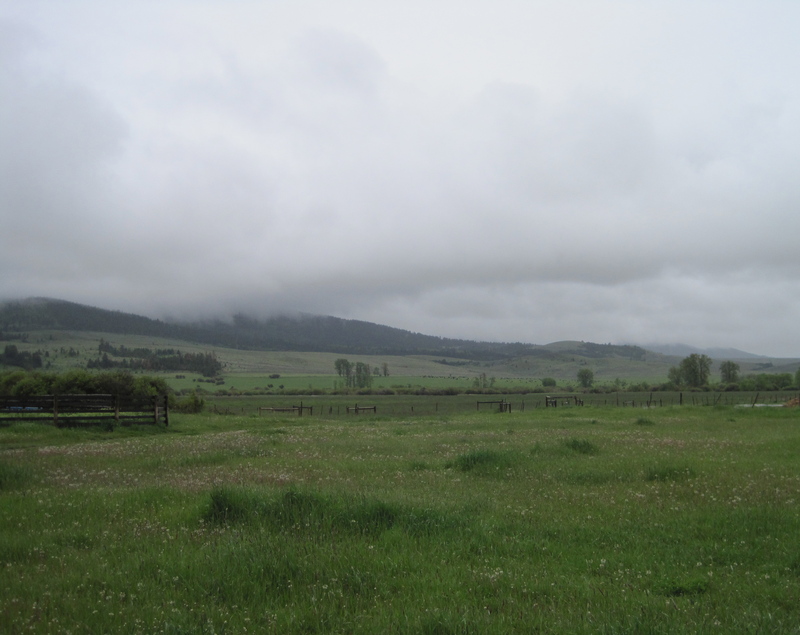 culinaria eugenius in montana: ride ’em, cowgirl! 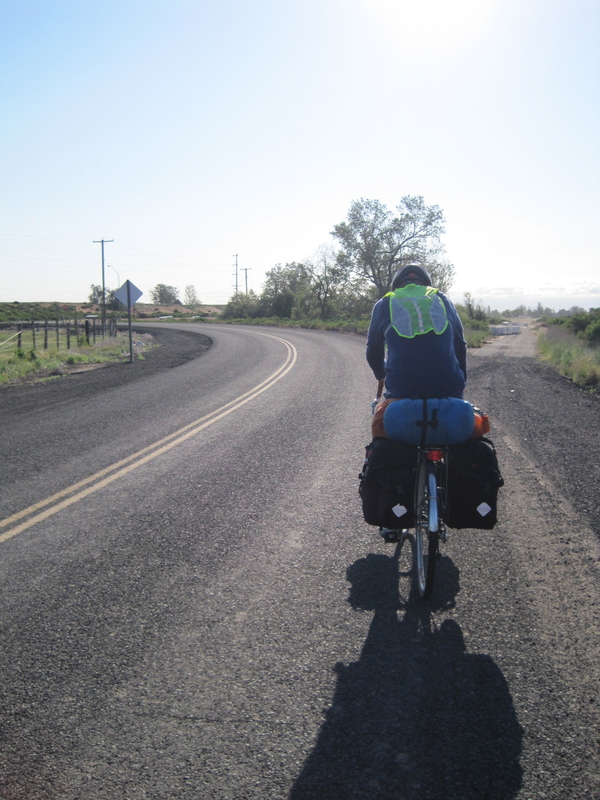 When last we heard from Culinaria Eugenius, she was in Spokane, missing one husband and headed off to the Big Sky Food and Agriculture conference in Missoula, MT. 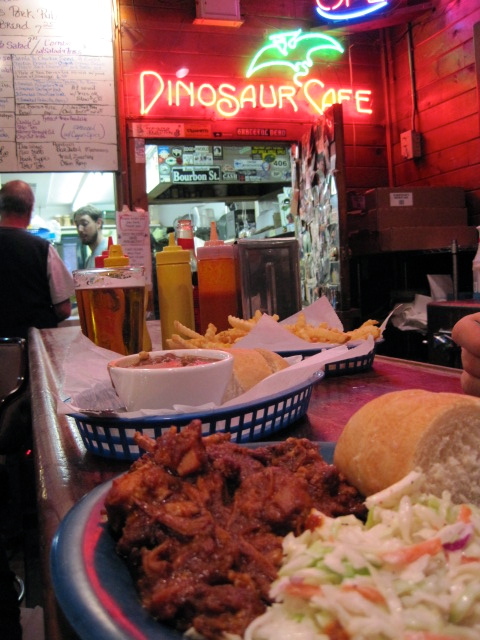 The husband, Retrogrouch, showed up a day early after biking from just outside of Walla Walla, WA to Missoula…just in time for a rather glorious cajun dinner at the Dinosaur Café. 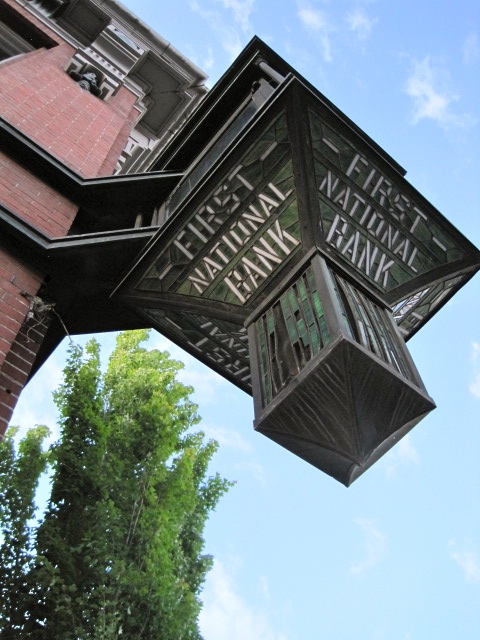 If you find yourself in Missoula, be sure to check this place out. It’s in the back of a dive bar called Charlie B’s on the main drag. You order everything from gumbolaya (gumbo on top of jambalaya, pictured here behind a boneless rib special plate) to crawfish etouffée to alligator-pork sausage po’ boys to red beans and rice. 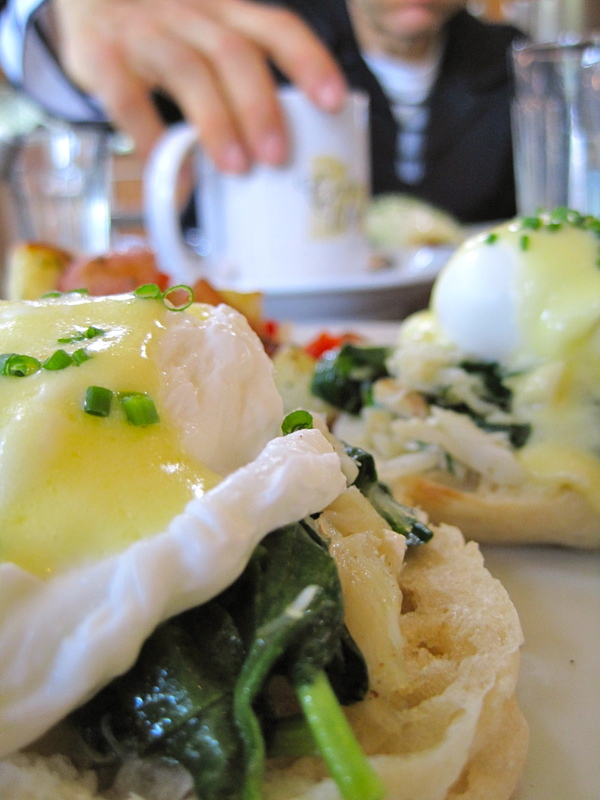 A reader suggested the excellent and more genteel Caffé Dolce, and we were very happy to partake in a smoked salmon omelet and (pictured) crab and spinach eggs benedict just before we left town. 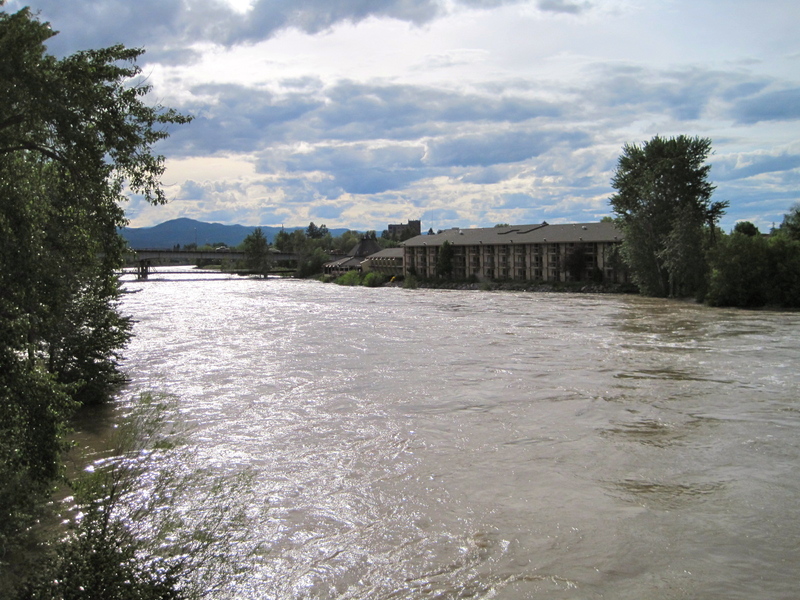 The waters were high in Missoula. The Clark Fork river was lapping the outside deck of the restaurant at my hotel, and like Eugene, the rains just kept comin’. I was really impressed by the still-spring flowers, especially the lilac trees everywhere in bloom. I shouldn’t have been surprised, given Montana has a 45-day growing season, with frost danger even during the season. The conference itself was quite good, with interdisciplinary panels and workshops on all aspects of food production and consumption. Some of the highlights for me: a panel featuring some of the great work OSU Extension does in their Small Farm program, a talk on foodways on the Oregon Trail, a panel on Japanese instant ramen and Singaporean cookbook rhetoric, and a workshop on food pedagogy for undergraduates. Above is some of the group off on a tour — talking about ranching at Rolling Stone Ranch in Ovando. We were hosted by the owner of the ranch, and he discussed his work with the Blackfeet Challenge group that brings together environmentalists and ranchers to mediate solutions that would work for the majority of the constituents in the community. 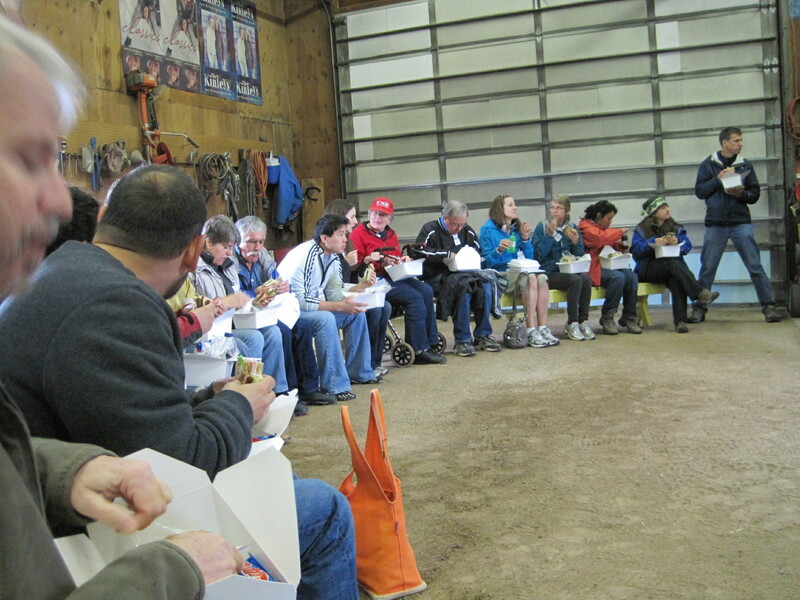 We also had a roundtable (tour was sadly canceled due to flooding and rain) at a ranch that had sustainable aspects to it, including the discovery of a new market for Montana beef: relatively wealthy, food-conscious liberals (like me!) who want their cow fed on grass and far removed from Big Ag systems of finishing and slaughter. The Mannix Bros., who have been ranching for well over a century in conventional methods, have the property pictured above. The Mannixes are taking the lead in providing what they call “grass-finished” (versus “grain-finished”) beef to local markets. To a Eugenius, this may not seem very innovative, given our meat CSAs and demand for more sustainable everything, but it’s big news among Montana ranchers, who see almost all their beef go off to the Midwest at the end of the season for grain finishing and slaughter. The Mannix family is keeping it small but the percentage of their herd and labor devoted to completely grass-fed beef: they started with about a dozen cows several years ago and are up to over a hundred this year. Rather grim to see that only one market and one restaurant feature local Mannix beef in Missoula. There’s real resistance to perceived lack of flavor in grass-finished beef. I had some at Scotty’s Table, a local/sustainable joint in Missoula, in a “beef duo” of hangar steak with a carrot-caper sauce and short ribs on a carrot purée. It was very good, and knowing the cow hadn’t been shipped back from Nebraska was even better. 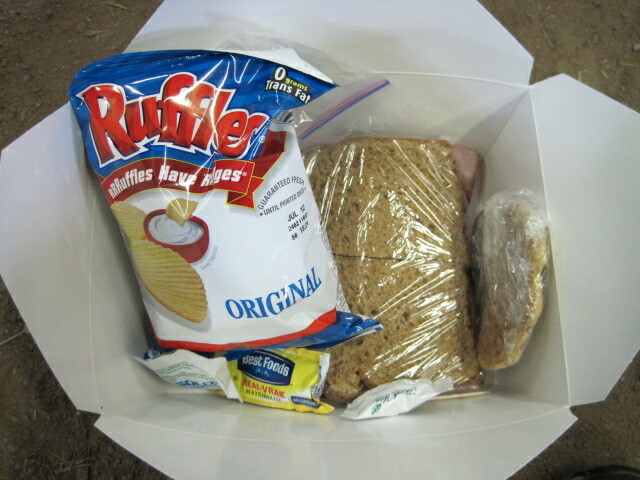 Ruffles, ham sandwich, cookie, and candy. Mountain Dew or Pepsi to drink. I don’t mean to sound ungrateful, but it really signals a tragedy in the local infrastructure if this is what the community relies on for sustenance when there’s so many natural resources, from grain to greens to fish to cattle. Where, for example, is a cottage dairy industry? Pulses? It’s difficult not to be outraged by the resistance to change in Montana foodways, but progress is being made. 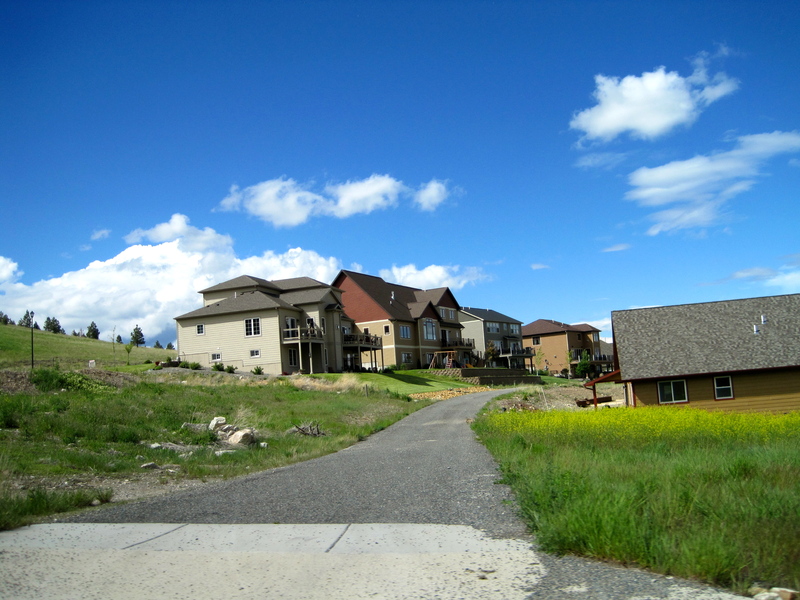 We learned, for example, that the Blackfeet community ranchers had successfully negotiated a purchase of developer-owned land in their valley, preventing more McMansion development, as we saw rife in Helena (above) after the conference. 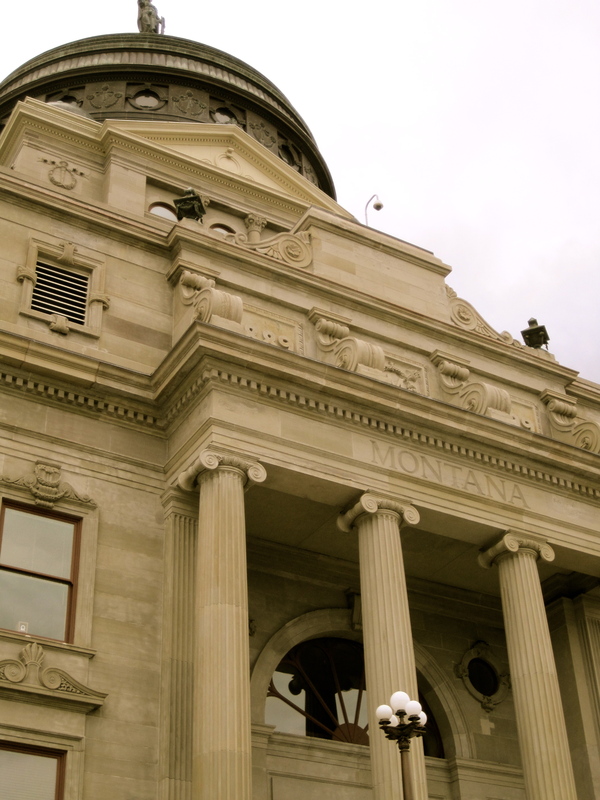 There seems to be a deep, deep federal pocket for conservation efforts in Montana, and I’d love to see more. I understand, however, that Montana has its hands full with tea party nonsense. 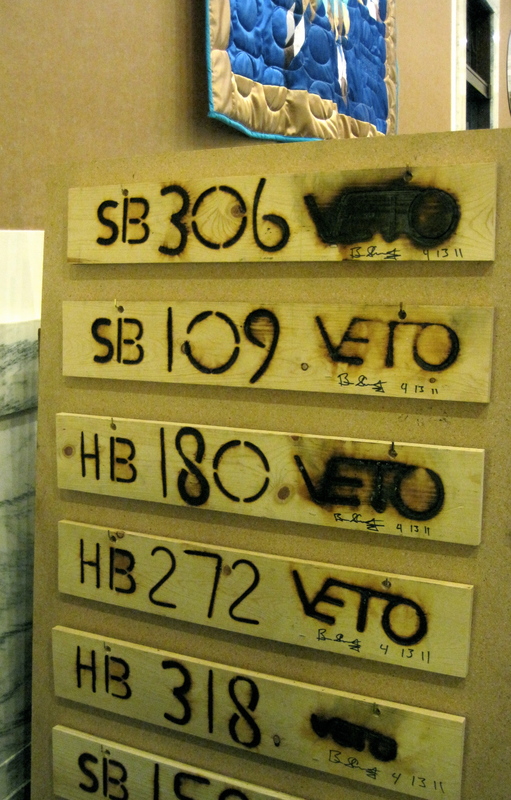 I quite enjoyed this veto branding billboard in the Governor’s office in the State Capitol building in Helena (which heads up this post). My sister and I wandered in as tourists, and saw all kinds of fascinating things, from working legislative offices to an old Supreme Court chamber. 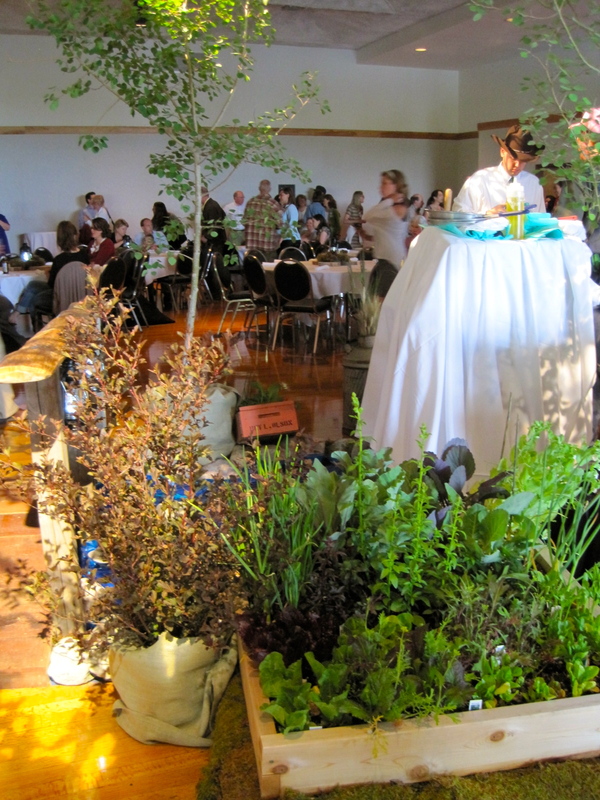 The food at the conference was excellent, and attended to with much devotion by the UM catering staff. Providing local vegetables in Montana in June is not easy, but the rolling hills grow all manner of grains, so we ate all kinds of grainy things. 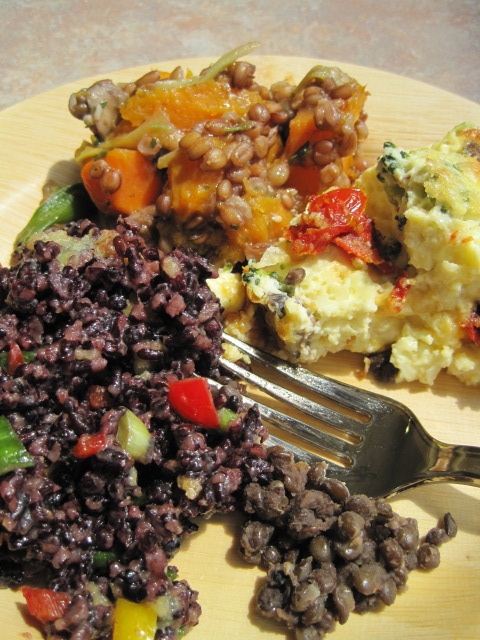 Every meal had bread, and lunches featured things like wheatberry salad with winter squash, forbidden rice salad, and quiche. 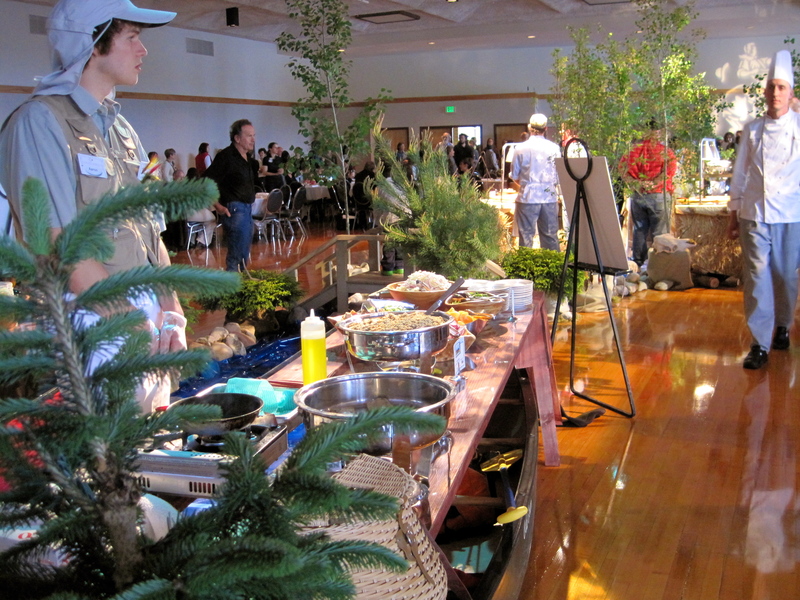 The conference banquet was a “Montana Feast,” featuring elaborate sets and actors dressed up in regulation gear, like this fly fisherman below, who parked his canoe under the table to fry up some rainbow trout for conference attendees. Behind him, a river made of blue cellophane paper with duck decoys and paper fish ran through it. An imported herb garden by the banks of the river was actually more impressive than some of the other stuff to me. How did they get that box of dirt and plants into the student union ballroom? Once the conference was finished, we took off to see my sister and her family for a couple of days. 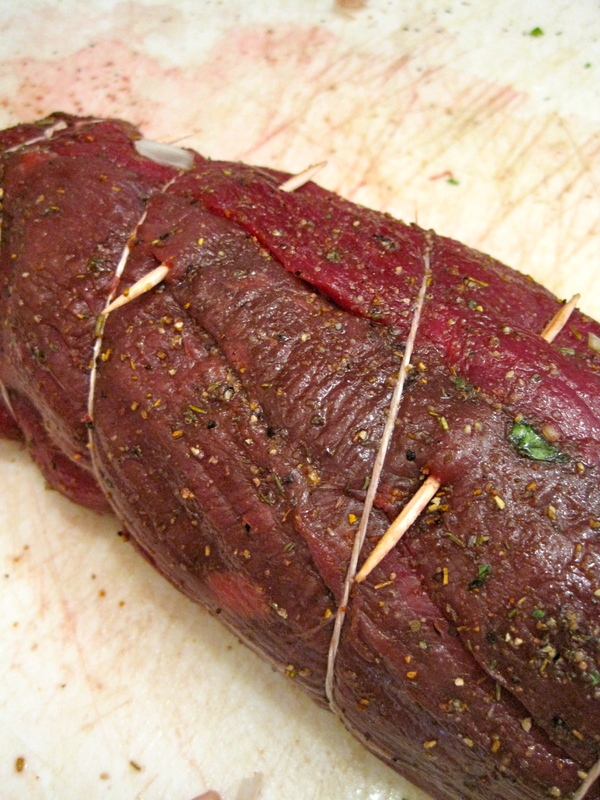 Next up: a recipe for stuffed elk tenderloin! 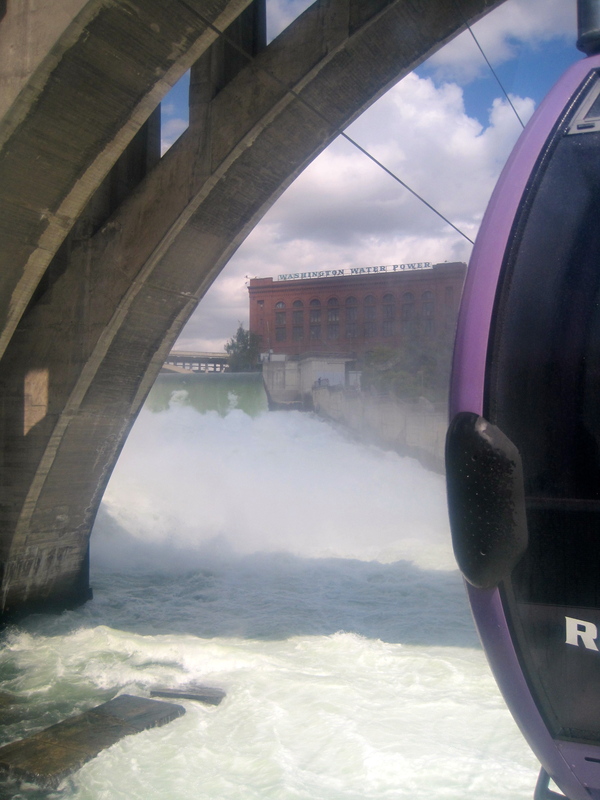 The Spokane River is no Liffey. Maybe ALP on steroids, flush with power. I’m entranced. 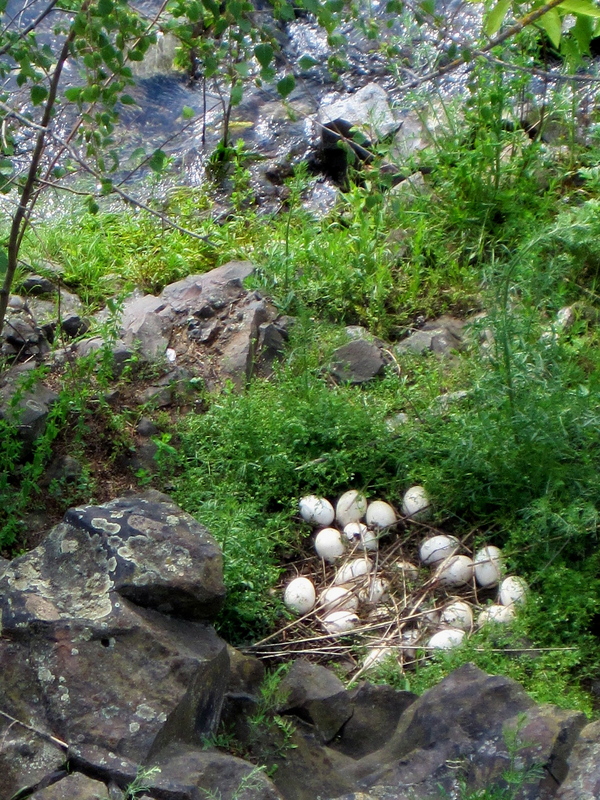 The rains make the current even stronger, and the banks are teeming with life. 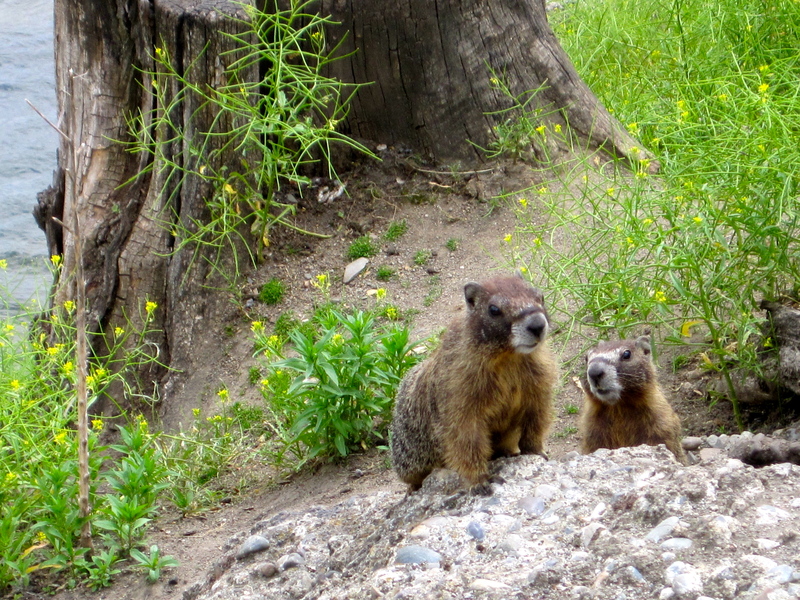 Funny little river prairie dogs or svelte woodchucks or evolutionary chipmunks (fill me in, peeps! ), for example. 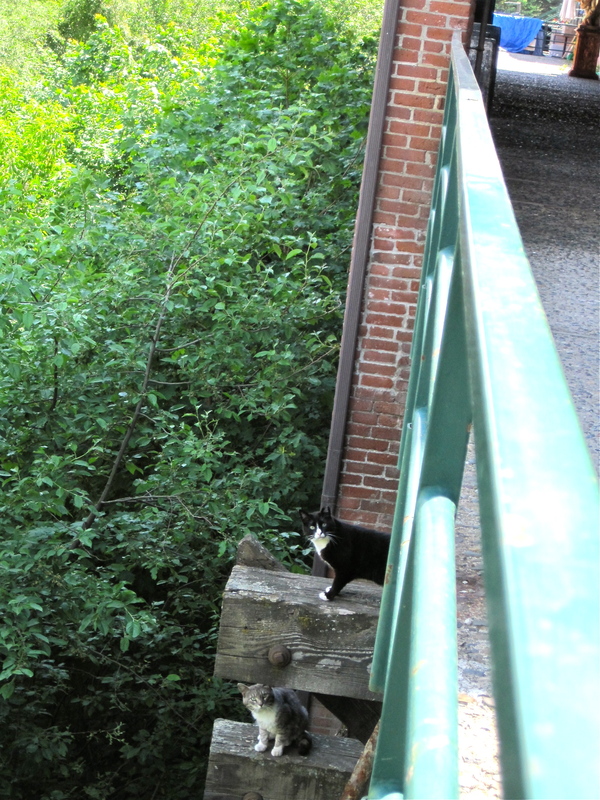 And trestles grow cats by spontaneous generation. And me? Me, I’m in a purple pod, high in the sky, overlooking it all. 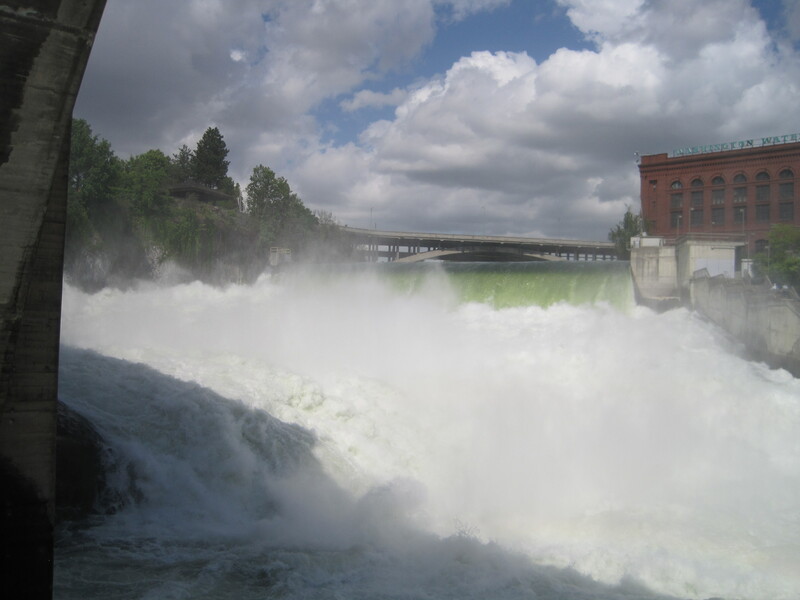 Hydroelectricity makes me high on life. This sky ride is one of the many delights of the former Spokane Natatorium park. 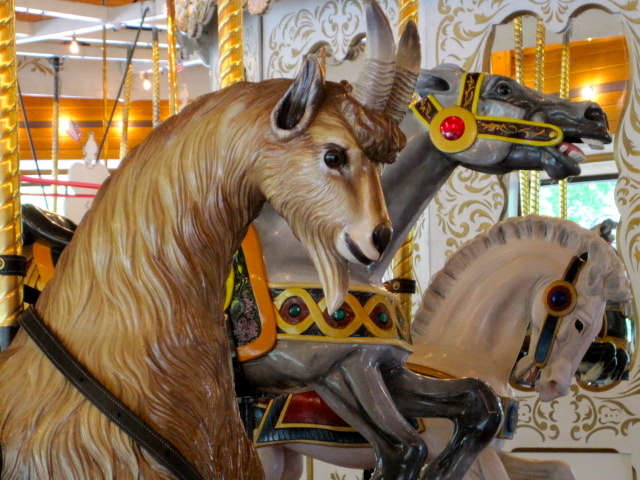 The 1909 vintage, restored carousel and amusement park games are another. 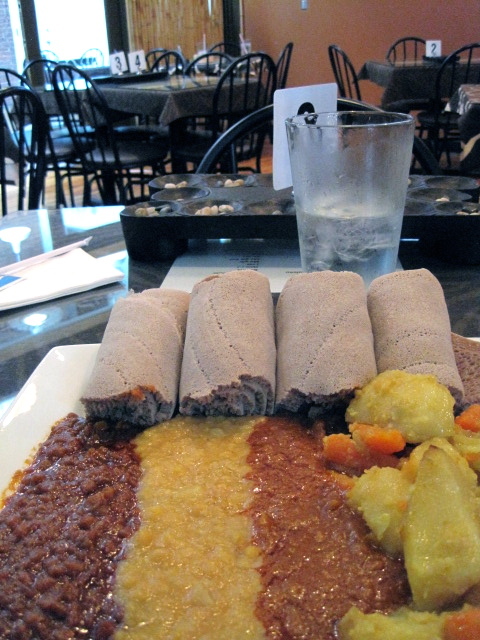 I’m only here for 24 hours, so I made sure to eat two of my can’t-get-in-Eugene favorites: Ethiopian and Sichuan food. I wasn’t remotely hungry for dinner after this vegetarian sampler lunch at Queen of Sheba, right on the bank of the river, but went anyway, thinking I could have leftovers for lunch today. For a Master Food Preserver never travels without her cooler! Was absolutely delighted by the “mostly vegan” cold appetizer tray at Gordy’s Sichuan. For $3 apiece, small plates are presented together like dim sum, and the diner can choose among five or six offerings. I opted for edamame and wheat gluten in ma-la oil, and a mixed spicy pickle with bamboo slices, mustard greens, and carrots. The dumplings marinating in a rusty red chili bath were good, too. A bit too large and potstickery than they had to be, but still yummy. Forgot my camera, but check out the menu here. OK, I’m off again! 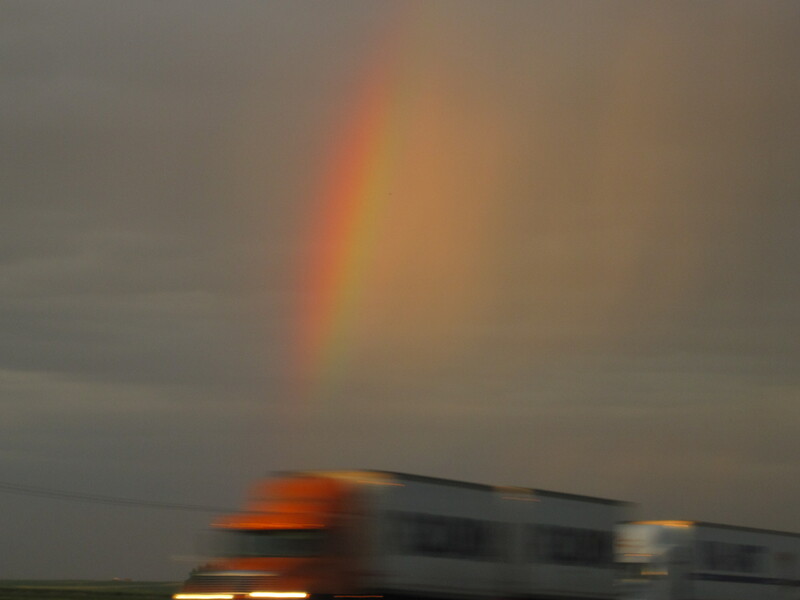 See you in Missoula, via my favorite mountain small town, Wallace, Idaho. I’m headed off to a food conference at the University of Montana – Missoula to talk about Edward Weston’s sinuous peppers and Gertrude Stein peeling potatoes. Very excited! 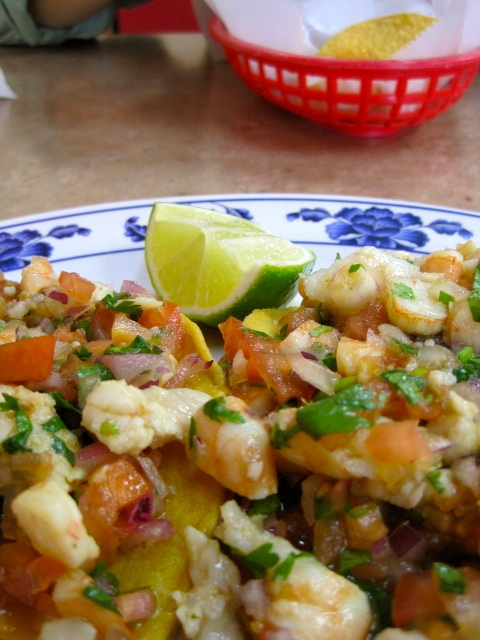 Stopped by places in two great towns — Luis’s Taqueria in Woodburn for a ceviche tostada and Doppio in charming Mt. Hood for some coffee and stained glass clock eye candy — along the way.